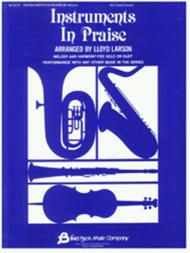 Instruments In Praise - Bass Instrumental Solos/Duets arranged by Lloyd Larson. For Bass Clef Instruments. Fred Bock Publications. Fred Bock Music Company #BG0727. Published by Fred Bock Music Company (HL.8738458).Melody and harmony for solo or duet for 8 songs: Come, Thou Fount • Come, We That Love the Lord • Day by Day, and with Each Passing Moment • Deep River • Savior, Like a Shepherd Lead Us • Stand Up, Stand Up for Jesus • and more. All the editions work together.